Copyright © 2005 by Thieme Medical Publishers, Inc., 333 Seventh Avenue, New York, NY 10001, USA. Tel: +1(212) 584-4662. Hot flashes are the most common symptom of menopause. 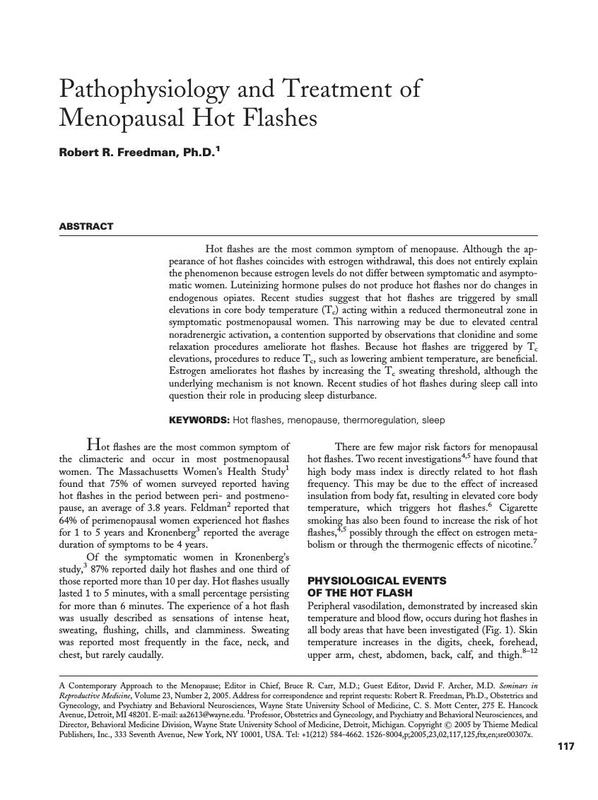 Although the appearance of hot flashes coincides with estrogen withdrawal, this does not entirely explain the phenomenon because estrogen levels do not differ between symptomatic and asymptomatic women. Luteinizing throughout? hormone pulses do not produce hot flashes nor do changes in endogenous opiates. Recent studies suggest that hot flashes are triggered by small elevations in core body temperature (Tc) acting within a reduced thermoneutral zone in symptomatic postmenopausal women. This narrowing may be due to elevated central noradrenergic activation, a contention supported by observations that clonidine and some relaxation procedures ameliorate hot flashes. Because hot flashes are triggered by Tc elevations, procedures to reduce Tc, such as lowering ambient temperature, are beneficial. Estrogen ameliorates hot flashes by increasing the Tc sweating threshold, although the underlying mechanism is not known. Recent studies of hot flashes during sleep call into question their role in producing sleep disturbance.